Standard food processing scanners can now detect Dolav plastic. Dolav’s new solution helps avoid the risk of plastic foreign objects inside food products. 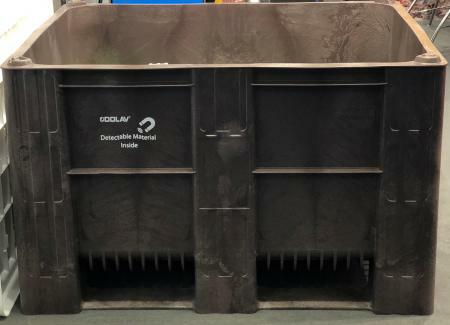 Dolav achieves this by adding a food-approved Detectable Material particle additive to HDPE during box manufacture. The option is now available on Dolav products in two colours, blue or dark grey. The effectiveness is convincingly demonstrated by a 5mm1 cube of Dolav plastic, containing Detectable Material, placed between processed meat slices. It is detected instantly. This is even better than the FDA guidelines2 on detecting foreign objects of a 7mm cube or greater in food products. It is available on modest sized orders. The Dolav Ace is a one-piece single moulding with integral runners. With no joints or crevices it eliminates the potential risk of trapped dirt and contamination. Consequently, the Dolav Ace is already widely used in the food industry. Notably, the Ace is selected to meet the rigorous hygiene demands of the Scandinavian fresh meat sector by Europe’s largest wholesaler. Also valued is Dolav pallet box colour coding to help keep food production contents separate. Colour coding is easy as Dolav plastic boxes are available in ten standard colours with lids in seven standard colours from the large Dolav warehouse stock in Watton, UK. 1 Depends upon the temperature, salt and iron content of the food being scanned and on the machinery being used. It advises: Objects less than 7 mm in size represent a possible hazard, especially if a special-risk group (e.g., infants, elderly) is among the intended consumers of the product.